Place prunes in a saucepan, separating any that are stuck together. Store in a covered container, refrigerated. 31 Comments on "Easy Stewed Prunes"
My mother used to stew the prunes with a slice of lemon and sometimes with dried apricots. Yummy!! I just stewed some very dried prunes I had forgotten about with some lemon slices and some clementina slices. delicious! just took 10 minutes. cant wait to try the vanilla and the cinnamin. and the apple juice. thanks for all the great ideas. All great recipes…anyone remember when Dannon Yogurt had Prune Whip as one of their flavors?…it was YUMMY!…I make my own now using Greek Yogurt.. I have my husband’s old family recipe for prune cake. It calls for a cup of cooked, mashed prunes. Any idea how long I would need to simmer them to ensure they mash? My grandmother did these often enough that there were always stewed prunes in the fridge. They were so good! I’d forgotten them until my doctor recommended them recently to counteract one of the side effects of chemo. I hope the stewed prunes are still working for you and wishing you good health. Long gone Aunt always made it. Prunes and bananas and whip cream in a bowl. Prunes were soft but not mushed. Did she boil the prunes? Thanks for all the tips. I remember eating prunes my mother made. They were good. Brings back memories. How long can it be storaged in fridge? My grandfather would wash oranges before peeling and then dice-up the orange peels and stew them with the prunes. It adds a complementary flavor to the prunes. He served the prunes with the orange peels mixed in. I’ve left them in and I’ve taken them out. I find there’s less resistance to the dish. Especially from younger folks, when the orange peels are removed. Remember: Resist the temptation to go too heavy on the orange peels, as a little goes a long way. 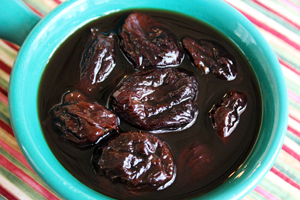 Hi Jenny, do you know where to find plain, dried pitted prunes? I’ve only seen the big brand names in the grocery stores. Also, not to sound dumb, but do I have to use dried prunes, or can prune recipes be made using the fresh plum? Check the bulk food section of your grocery store. Sometimes they have packaged generic foods like nuts & raisins. Theu may also have prunes too. Even the big name brands are just plain dried prunes… you should also be able to find stores brand at a lower cost. Fresh would not work the same as dried. I just bought a bag of dried pitted orunes in CVS. They were buy 1 get 1 half off for thr 8 oz. bag. I got a 7 oz bag at Dollar General for $2 and a 12 oz bag at Save A Lot grocery for $2.69. The 12 oz bag prunes were plumper. To make the syrup thicker, start by using just enough water to cover prunes. After it begins to simmer, keep adding just enough water to cover the prunes. Simmer your prunes low and slow, paying close attention to the water level, and remember to keep adding enough water to cover. Stew for apx. 2 hours, then let the pot rest until cool, apx.2-3 hours.Then refrigerate your stewed prunes in a glass jar. The water will have developed into a think, delicious syrup. That sounds like an old German recipe we had at Thanksgiving (many, many years ago). I believe it required quartering the prunes and simmering them for about 30 – 45 minutes. I don’t recall measurements, but I think you’d want a bit more water than needed for stewed prunes. The prunes and juice were left overnight in the refrigerator, then reheated before the feast. Sometimed, raisins were added. The result could be thickened if needed with a bit of arrowroot or corn startch if needed. I think some cloves or cinnamon may have been added. It went well with ham and biscuits. Hope this helps. Yes Capt. Dave! My mother made them and I distinctly remember flavors of cinnamon and cloves. Very delicious. Even after they were refrigerated they were good the next day straight from the fridge. I like to use apple juice instead of water- makes them almost a treat! I like to put a cinnamon stick in the water while they stew! Extra flavor!! I have heard that although deliciously tasty the addition of cinnamon to the prunes counteracts the digestive benefits of the prunes. Is this true? Actually, “blocking” fat absorption and rushing fat (and everything else) on through the digestive system are kind of the same thing. But, that’s all I know about the answer to the question. Opinion: too many worries over the interactions of foods for me. If you like them with cinnamon, eat them that way.